Over at Splitcoast today we have two challenges – our Queen for the Day…Mary; and the Free for All…anything but a card. So to honor our queen, who loves butterflies, here’s a little Fancy Favor bag. Are you sick of this designer paper yet? I’m trying to use up what’s in my craft room these days. Again, the paper is retired, as are the brads, the Accents and Elements flowers, and the image from SU which is from the Of the Earth stamp set. The image was stamped in Close to Cocoa before it was put together using my Stamp-a-ma-jig to line it up. The handle was made by taking a strip of designer paper and laying on the edge of the die, cutting one side and then turning it around to cut the other side. I covered the backs of the brads on the handle and the inside of the bag with punched flowers and Sticky Strip. 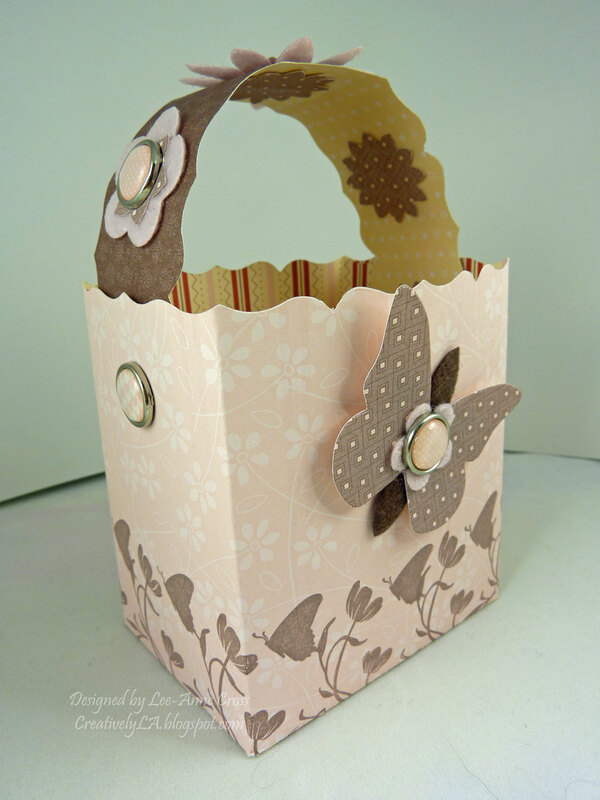 The little butterflies are made with the SU Beautiful Butterflies Bigz die, and two flowers from the Accents and Elements kit. Yes, the butterfly’s body is actually just two petals of the flower showing from behind. The flowers along the handle are a combination of more of the Accents and Elements flowers and punched flowers made with the SU Boho Blossoms XL punch. Hope you enjoyed this today! Have a wonderful day everyone!